The complete set of raw photos is here. 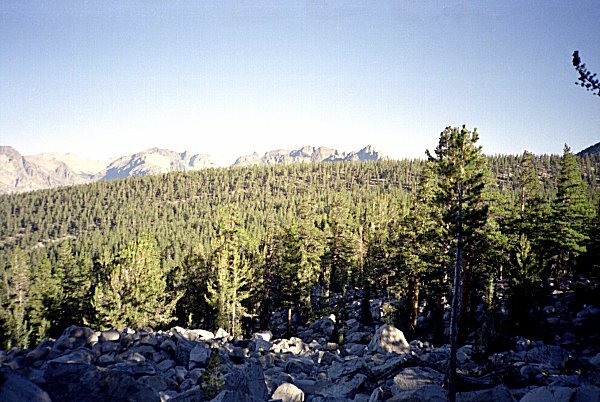 I had never before been north of Cedar Grove in Kings Canyon. This trip was planned with an eye to exploring some of this territory. One of the advantages of flying west is that the time change works in your favor. I have always thought it remarkable that I could leave home in New Jersey in the morning, fly to Fresno, and get up into SEKI the same afternoon. This time I aimed to beat that -- if everything worked as planned I could get my wilderness permit that afternoon and hike in to the first camp area the same day. I had been through the drill enough times that I know where to get fuel, how long it would take to get to the park, and so forth. Although the plane was delayed a little bit, and there was some more delay in getting the rental car, I drove like a madman and got to the ranger station 10 minutes before closing time, and picked up my permit. The hike up Copper Creek was memorably hot, even though I started at 5:00 PM. I always have such incredible energy the first day -- good to make use of it. The trail climbs from 5000 feet to almost 8000 feet in about four miles of switchbacks. I was soon drenched in sweat, but didn't feel a bit tired. It got dark enough for me to break out the flashlight just ten minutes from Lower Tent Meadow. I spied the bear box, dumped my food in it, and stretched out on the ground. In a few minutes I was fast asleep. I did not see anyone else, but I did not see anything else either. Well past midnight a pair of hikers showed up and made camp a few yards away. In the morning I spoke to them just as I was leaving. They were headed in the same general direction as I, but they were intending to go off trail, over Goat Mountain and somehow to Marion Lake. I wish them well, and look up dubiously at Goat Mountain. I am planning a less ambitious route to Marion Lake, crossing Granite Pass, passing Horseshoe Lakes, and crossing Windy Ridge. The second day, as usual, I am extremely tired. I pass close to Mt. Hutchings, so I take a two our side trip to climb it. It is really not much of a climb as a stroll along a ridge. This shows Goat Mountain from Mt. Hutchings. 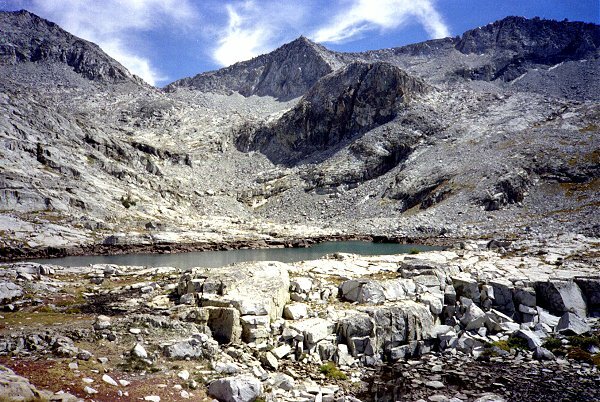 Granite Basin is to the left (out of the picture). Mt Hutchings also has a spectacular view of the valley of Kings Canyon. Although the peak is really just a bump on the ridge, it commands a wonderful view of the valley below. 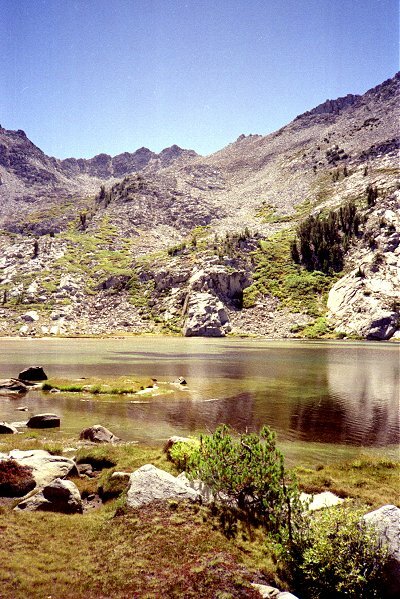 I continue on into Granite Basin, and camp by one of the lakes there. I remember being so tired I am almost shaking, but I remind myself that yesterday I got out of bed at 5:00 AM, suffered jet lag, hiked until midnight (eastern time), and ascended to 10,000 feet. The lack of sleep, exertion, and altitude all take their toll on the second day. The next day I feel better. It helps that the biggest part of the climb is past. I wander around the basin, and then head back to the trail. Just beyond Granite Pass, I encounter a crew working on the trail. They are just finishing the season -- this being September. I have never been hiking this late in the season, and I am a little concerned about running into cold weather or snow. So far, it has been sunny and warm. They inform me that it could snow at any time, but that if it does it will probably melt in a day or two. Let's hope so. By the middle of the morning I reach State Lakes. 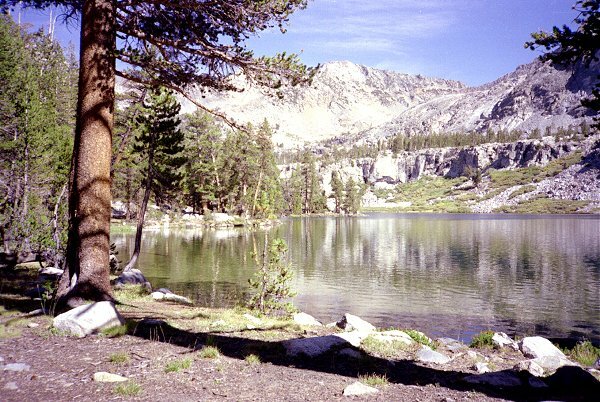 The last place before leaving the trail is Horseshoe Lakes. From Horseshoe Lakes, the route leads up this forested ridge, to the right. I thought that the tree cover would make it difficult to find my way. I am used to hiking in open territory, where I can see and navigate by landmarks. Actually, it turned out that I could see well enough that it was not a problem. 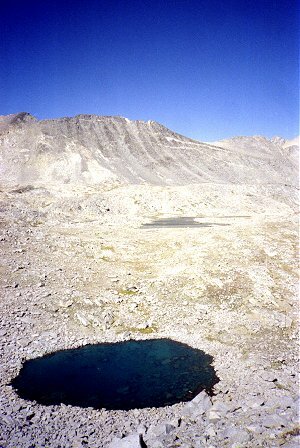 As I ascended Windy Ridge I came across some small lakes formed, like this one, from terminal moraines of receding glaciers. 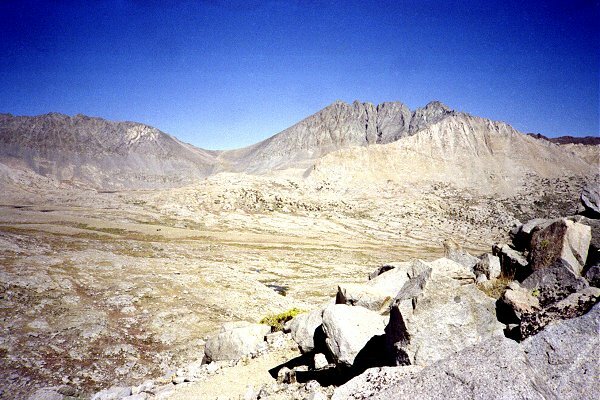 Cirque Crest is in the background. 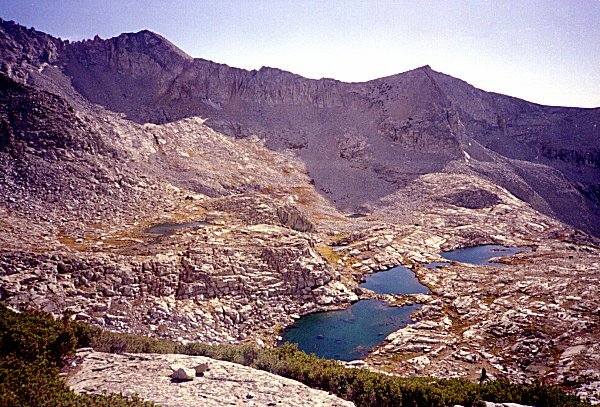 The route passes between Cirque Crest above and Cartridge Creek below. 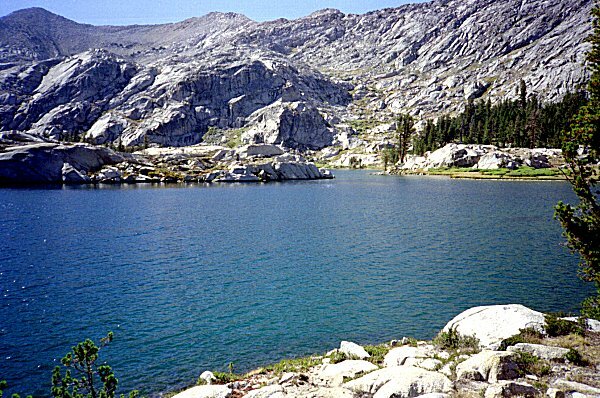 This is the lake just west of the South Fork of Cartridge Creek. 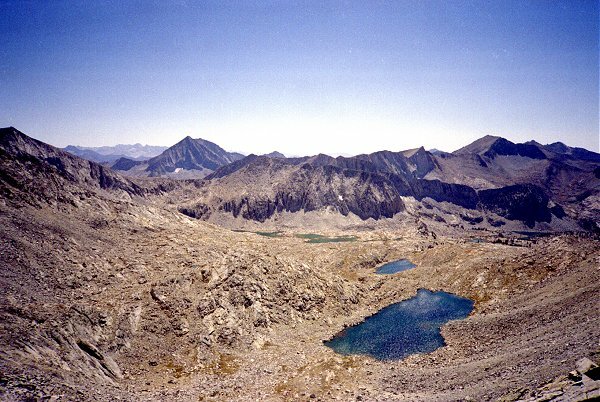 This tarn is the headwaters of the South Fork of Cartridge Creek. Behind it is Cirque Crest. 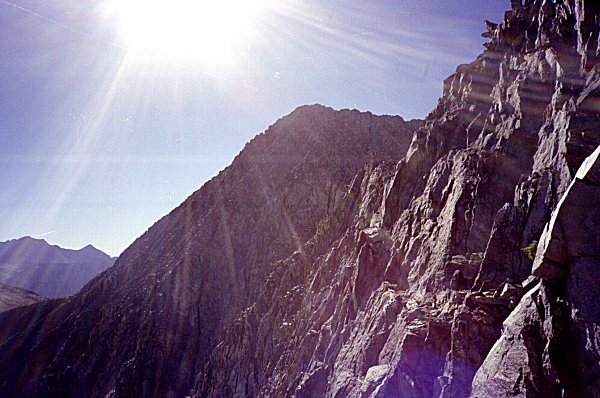 .Travelling beneath the crest, toward Marion Peak, the route goes higher and higher, approaching the ridgeline. The feeling of being "up in the air" is invigorating, tension provoking. I spent the night up in this high, cold, desolate area. I wonder how many hikers pass this way every season. I have not seen anyone since I passed the trail crew near Granite Pass. 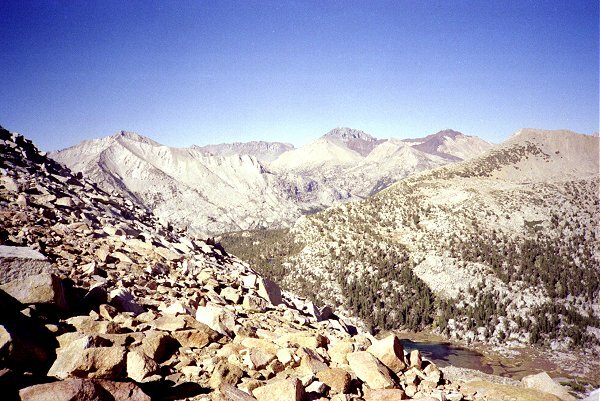 The next morning, I reached the ridgeline, the one on which Marion Peak sits. I got the idea that if I could, I would simply follow the ridge to the peak, and then descend to the lake. This worked out for a while, until I got to a spot on the ridge that went straight up. I looked at the map, and decided that maybe I could cross to the other side of the peak without losing too much altitude, and attempt the peak from the other side. This shows the peak from the closest I could get on the west ridge. I tried to stay as high as possible, working my way beneath Marion Peak, to find a place I could get back up to the ridge, and then on to the peak. Here the peak is to my left and behind, and I am looking for a way up the cliffs to the ridge beyond. Eventually I found a way up, and then the route along the ridge to the top was straightforward. 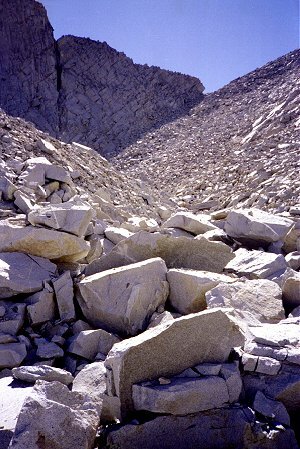 As you can see, Marion Peak is the older, red rock, in contrast to the lighter granite all around. 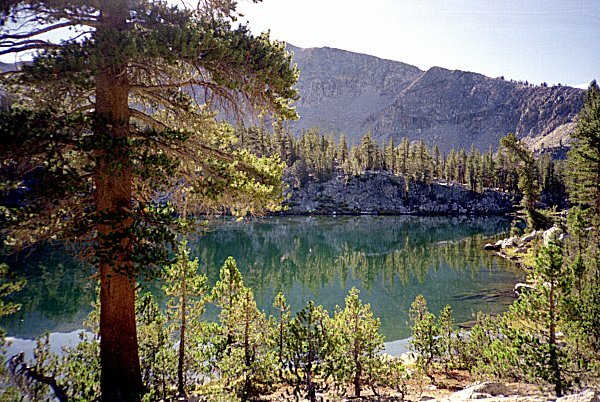 This shows Bench Lake, which is on the other side of the South Fork of the Kings River. In other words, there is a deep canyon between here and the lake, only a little of which is shown in the picture. Just behind Bench Lake is Mt. 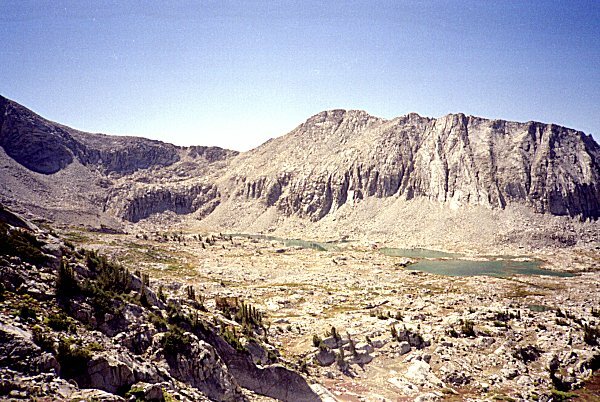 Ickes, and on the horizon are the peaks surrounding Gardiner Basin. 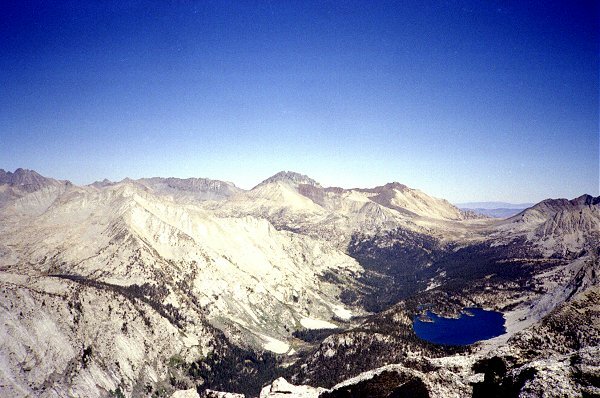 Arrow Peak, where I am heading later, is to the right of Mt. Ickes, off the picture. I plan to leave the trail at Bench Lake, travelling into the basin to its right, so I spend some time studying the terrain from this high vantage point. Finally, I descend the ridge I came up, and make my way down to Marion Lake. 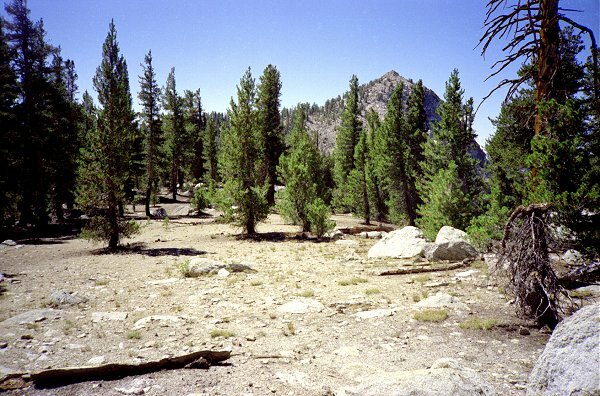 I meet up with the party that I last saw at Lower Tent Meadow, who had come over Goat Peak. They were surprised that I had been able to climb Marion Peak, and asked about my route. This picture shows where I crossed from right to left on the talus just below the highest cliffs, to the notch to the left of the peak. The route down from there was less challenging than it looks here, the cliffs in the foreground being easily bypassed. I had a choice in how to get to Bench Lake. 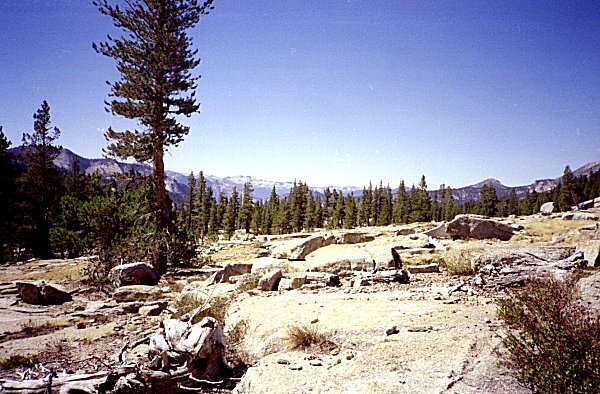 There is a trail shown on the map: Cartridge Pass Trail. 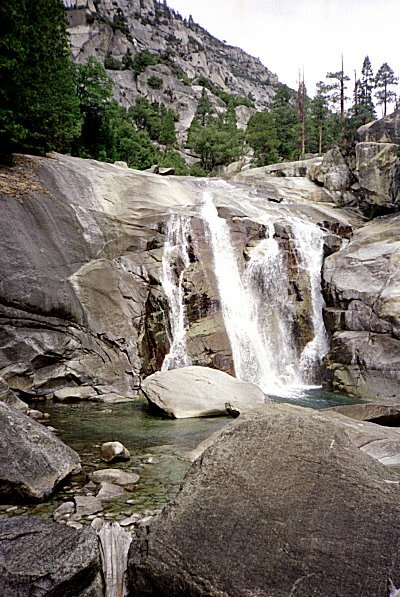 It is an old, unmaintained section of trail, which drops into the South fork of the Kings. This would have been easier, but I wanted to do some more exploring. 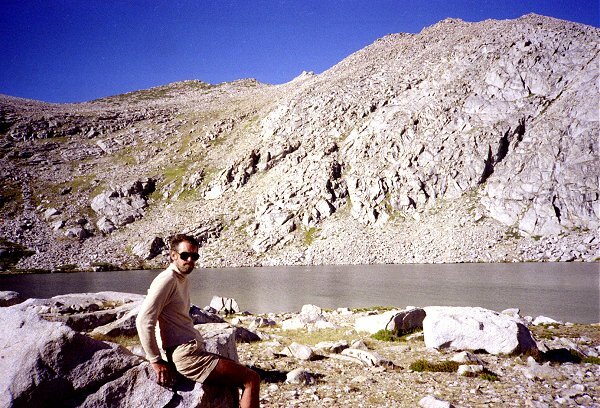 I elected to ascend Lake Basin, cross the ridge near Vennacher Needle, and join the John Muir Trail near Upper Basin. 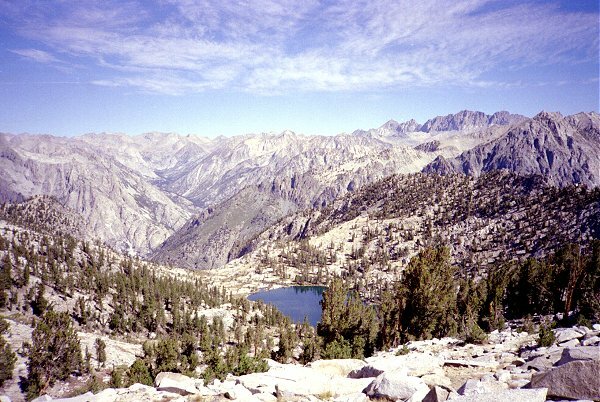 This shows some of the lakes in Lake Basin. Cartridge pass crosses the basin and heads over the ridge on the skyline. This photo was taken on the way up the opposite ridge. This route took me most of the day to cover, but was not especially difficult. The view from the ridge, back to Lake Basin, was spectacular. This shows the highest lakes and the route up. 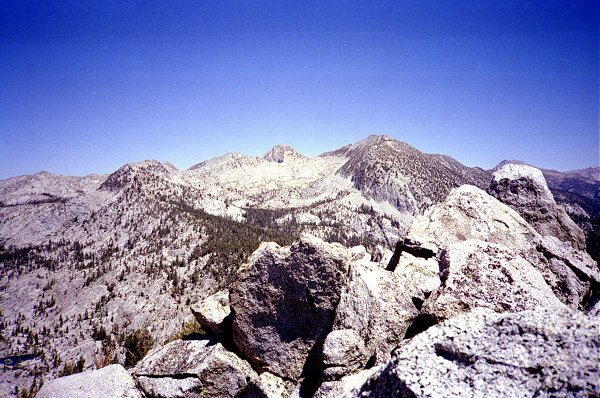 The prominent peak on the left is Marion Peak. Looking in the other direction, the strange colored rock of Upper Basin was visible. The mountain in the center is Split Mountain. 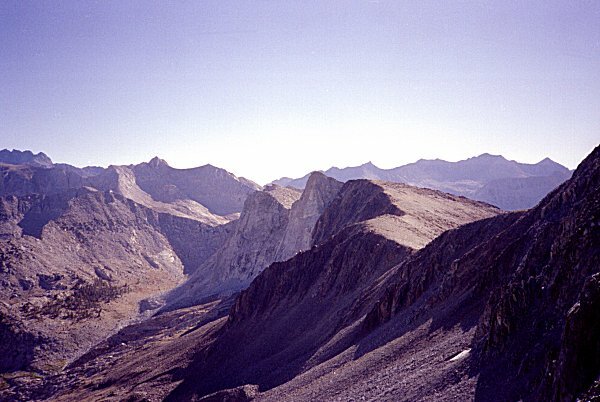 The John Muir Trail comes through a pass on the left (Mather pass) and crosses through the valley below. As beautiful as the view of Upper Basin was, I was sorry I had taken this route rather than the more cautious Cartridge Pass trail. This is what I could see immediately to my right, and the slope immediately in font, which I would have to descend, looked not much better. I was unsure whether I had crossed the ridge at the "correct" point, but I was too tired and it was too late to turn back (or so it seemed at the time). I cautiously made my way down the steep rocks, ledge by ledge, fearing a cliff that I could not see. Once I made it half way the slope got gradually less and less steep, and no impassible cliffs appeared. I was immensely thankful as I approached the lake at the bottom of the cliffs, where I made my camp. I made it to a campsite as darkness was falling. My legs were so tired that they were shaking. But I could relax, because I could see the rest of the way down to the basin. 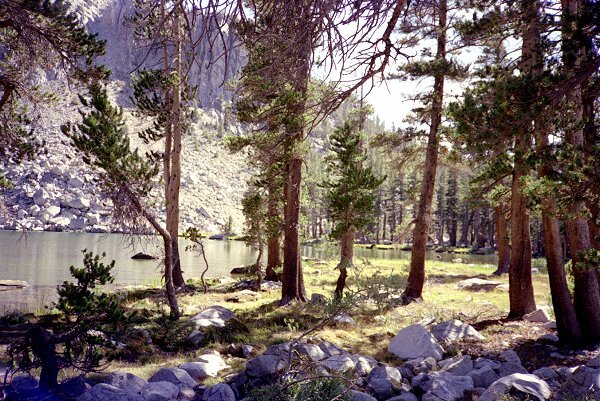 The next day, I made my way down to the John Muir Trail. I saw a couple of people, then another person coming up to Bench Lake. I reached the lake about lunch time, and headed towards the end of the lake, which is also the end of the trail. 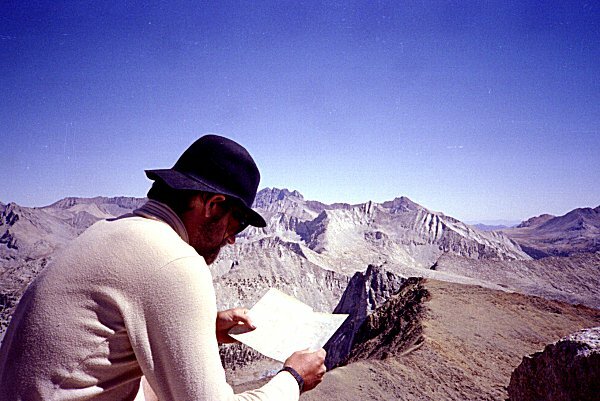 I was aiming to climb into the Arrow Creek drainage by crossing a divide to the left of Arrow Peak. This is the route into Arrow Creek drainage, known as Arrow Pass. I went around the lake to the left, ascended diagonally up to about the center of the picture, and then climbed straight up toward the ridgeline. There were no real obstacles along the way -- a nice climb. Looking back from Arrow Pass, the lake shown in the previous picture is visible in the lower right, Mt. 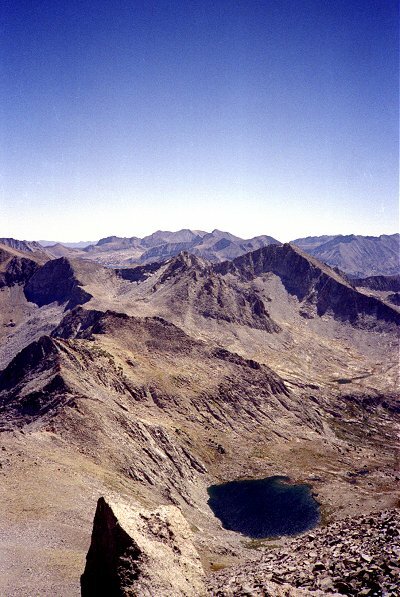 Ickes is on the far right with Bench Lake hidden behind it, and Marion Peak is on the skyline near the center. Finally, here is Arrow Pass from the highest lake in Arrow Creek. The descent was neither very far nor very difficult. I felt truly alone in this area -- there were no signs of campsites, no trail markers, no sign that anyone had been here before. The next day I decided to climb Arrow Peak. 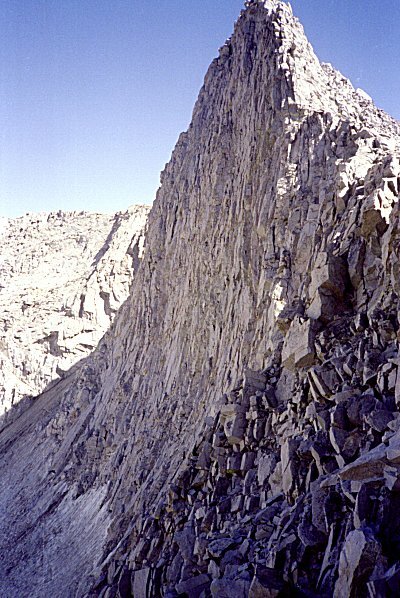 I headed back up to the pass, and from there I climbed the ridge and the southeast face. 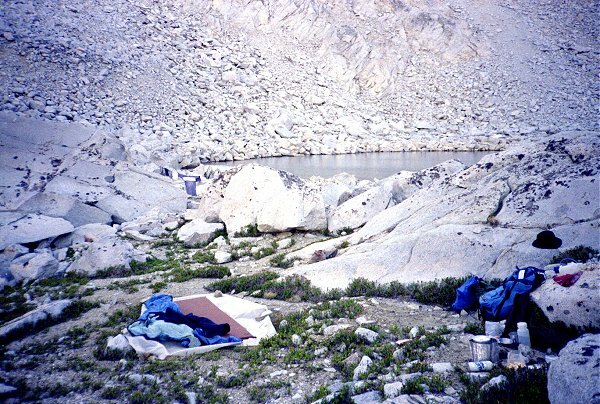 This shows the lake by which I am camped from high up on the face. 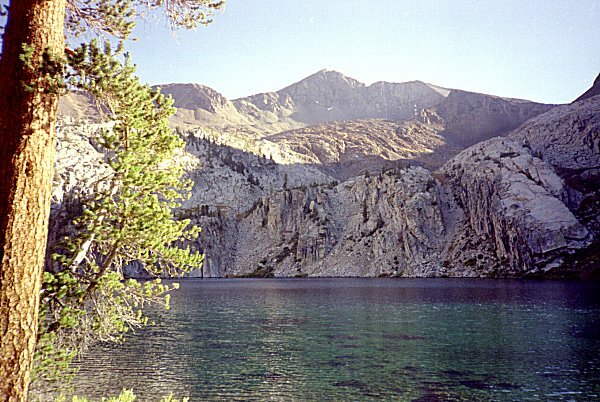 The peak behind the lake is Pyramid Peak. From Arrow Peak, Bench Lake came into view again. 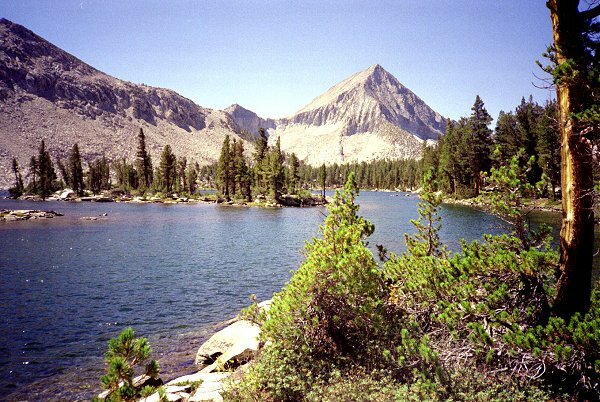 Behind the lake is Tabose Pass, an entry route to the John Muir Trail. The deep valley of the Kings is visible to the left of Bench Lake, making clear how it got its name. Mt. 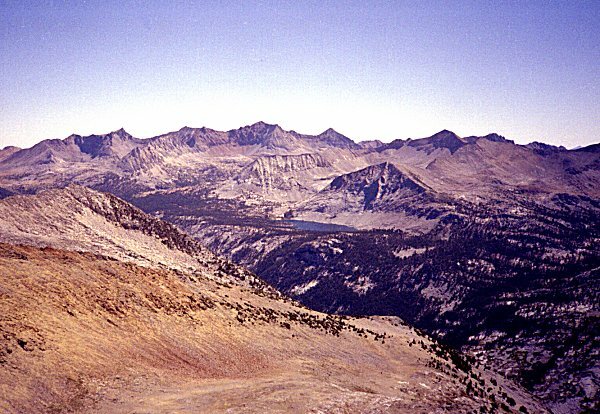 Ruskin is the light-colored peak across the valley. Marion Peak is farther to the left, not visible here. I descended from Arrow Peak and took the rest of the afternoon to explore the upper reaches of Arrow Canyon. I hiked down the canyon a couple of lakes, and sat down to contemplate the beauty. By and by I saw a couple of hikers slowly moving up the canyon. They were without packs, and appeared to be wandering around aimlessly. They appeared not to see me, so I respected their privacy and just sat quietly on the rock. In a while, they wandered my way, and came within 10 yards before they noticed me. They seemed quite startled to see me there, also without a pack. We exchanged greetings, chatted a little about whether or not there were trout in the uppermost lake, and finally asked each other about how we had gotten where we were. This couple told me that Arrow Creek was their favorite place in the Sierras, in the whole world in fact. They had been coming there together each year for the last eighteen years, and this was the first time they had ever seen anyone up there. They had come up from Paradise Valley, as always; they had never climbed Arrow Pass. Since I had never come up Arrow Creek, they gave me some advice on how to get through a particularly tough spot near the bottom (keep left). With this we parted -- they were camped farther down the valley. This is the only picture I have of Arrow Creek, other than of the lake at its head. I spent a long, leisurely day hiking down the canyon, crossing back and forth the modest stream. I did not see the other couple, but I was not looking for them either. I made camp about three quarters of the way down, in a pleasant wooded area near the creek. The next day I continued down the increasingly steep canyon. At this point the couple's advice became critically important. It seemed like the canyon floor turned into cliffs: cliffs above to the left and right, cliffs below in front. I ventured down a couple of times, only to retreat back up again when the way became impassible. I kept in mind the advice to go left, but it did not look any better. Then, miraculously, as I was sitting frustrated on the edge of a cliff I spotted the other couple, just a tiny speck below. They were only visible for a few moments, but I could see where they were, so I know where I had to get to. I looped back up even further, angled even more to the left, and got into a crack that was so full of brush that my feet could not reach the ground in places. But it lead down, and at long last I was on the lower slopes, near Woods Creek. I have attempted to capture the critical maneuver on the map, but use you own judgement if you are tempted to try this. It is probably a lot safer going up. This was my first trip down Paradise Valley, and the abundance of waterfalls captivated me. This is Mist Falls, the most spectacular of the falls. I should have tried harder to get some people in the picture -- the falls are really much larger than they look here. The water comes crashing down, throwing spray up and making everything around wet and slippery. 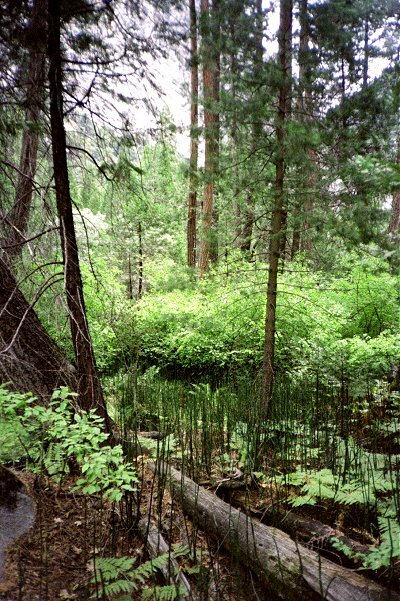 At the bottom of Paradise Valley, where it joins with Bubbs Creek, there are some strange plants, that look like green sticks. They are jointed, a little like bamboo, but apparently have no leaves. I have seen them nowhere else in the Sierras.